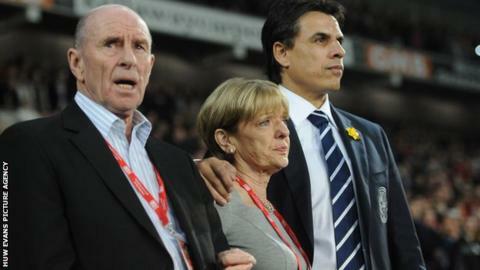 Gary Speed's father has called on Wales fans to get behind boss Chris Coleman ahead of the World Cup qualifiers against Scotland and Croatia. Coleman was named manager in January following Speed's death but has lost all four games he has taken charge of. "Get behind Chris Coleman. For me and Gary, please," Roger Speed said. "I wouldn't like the job he's got to do to take over after Gary because Gary was doing an absolute tremendous job. I really, really feel for Chris." Coleman inherited a Wales side that had won four out of five games under Speed during the latter part of 2011. They have lost all five games since then, suffering defeats to Belgium and Serbia in their opening two World Cup qualifiers. But Roger Speed says the 42-year-old Coleman, a former manager of Fulham and Coventry City, should stay in charge. "Some supporters, the Welsh, can be a little bit fickle because things are going down," he said. "It's no good sacking him or getting rid of him. Get behind him." He added: "I've known Chris since Gary and Chris were playing together. They were mates. All I can do is wish him all the best." Wales, who are bottom of Group A, face Scotland at Cardiff City Stadium on Friday before travelling to Croatia next Tuesday. Assistant manager Kit Symons said Coleman is in a positive mood despite a 6-1 defeat in their last match in Serbia. "As a manager, bad results and performances hit you harder than anyone," Symons said. "The players suffer but I think the manager obviously takes the main brunt of it. He's a big character, he's a big personality and he's dusted himself and ready for battle again." Barnsley striker Craig Davies has been called up for the qualifiers because Cardiff City's Craig Bellamy has a knee injury. Swansea's Jazz Richards and Bristol City defensive duo Lewin Nyatanga and James Wilson also come in after Joel Lynch and Dave Edwards withdrew. James Collins is suspended. Wales Squad: Jason Brown (Aberdeen), Lewis Price (Crystal Palace), Owain Fon Williams (Tranmere Rovers), Darcy Blake (Crystal Palace), Ben Davies (Swansea City), Jazz Richards (Swansea City), Chris Gunter (Reading), Lewin Nyatanga (Bristol City), James Wilson (Bristol City), Adam Matthews (Celtic), Sam Ricketts (Bolton Wanderers), Ashley Williams (Swansea City, capt), Joe Allen (Liverpool), Andy King (Leicester City), Joe Ledley (Celtic), Aaron Ramsey (Arsenal), David Vaughan (Sunderland), Gareth Bale (Tottenham Hotspur), Simon Church (Reading), Steve Morison, (Norwich City), Hal Robson-Kanu (Reading), Sam Vokes (Burnley).